Alex & Ani Community Service volunteers and staff from Blackstone Heritage Corridor participated in a clean-up, inside and out, at the Smith-Appleby House. Historical Society of Smithfield President Deb Cote and Program Director Margaret Botehlo represented the Society and accepted the Award for the House. 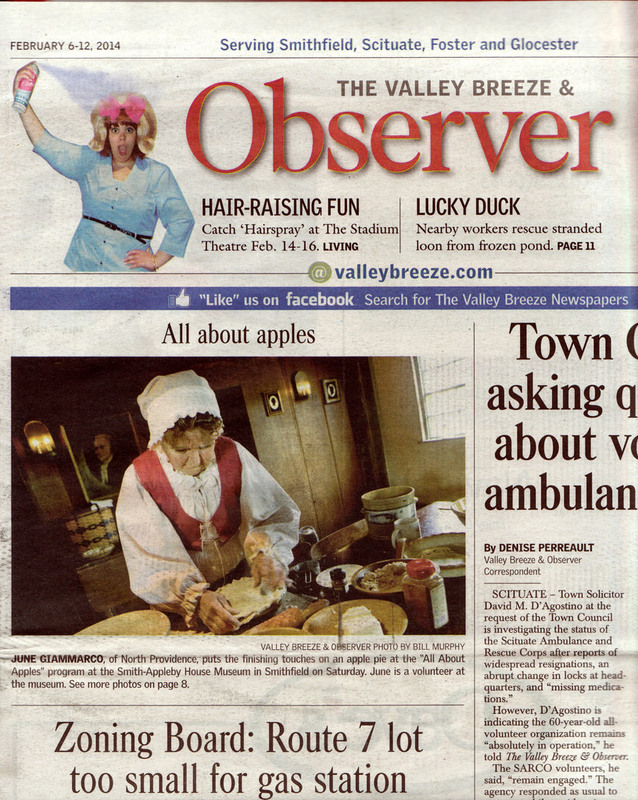 Our Antiques, Collectibles and Craft Show on October 19, 2014, made the front cover of the Valley Breeze & Observer‘s October 23rd issue. If a breakfast with a historical bent is what you’re craving, look no further than the 41st annual May Breakfast at the Smith Appleby Museum. 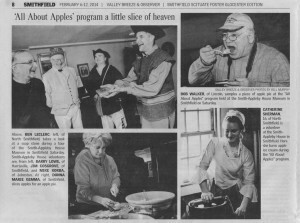 The breakfast is merely an appetizer for tours of the historic farmhouse featuring educators donned in colonial garb. Food highlights consist of baked beans, breads, coffee, orange juice and Johnny cakes. The house dates to 1696 and reminds you just how much history we have in our little state. Sunday May 4th is the date on this one. $20 per person includes a house tour, reservations required. 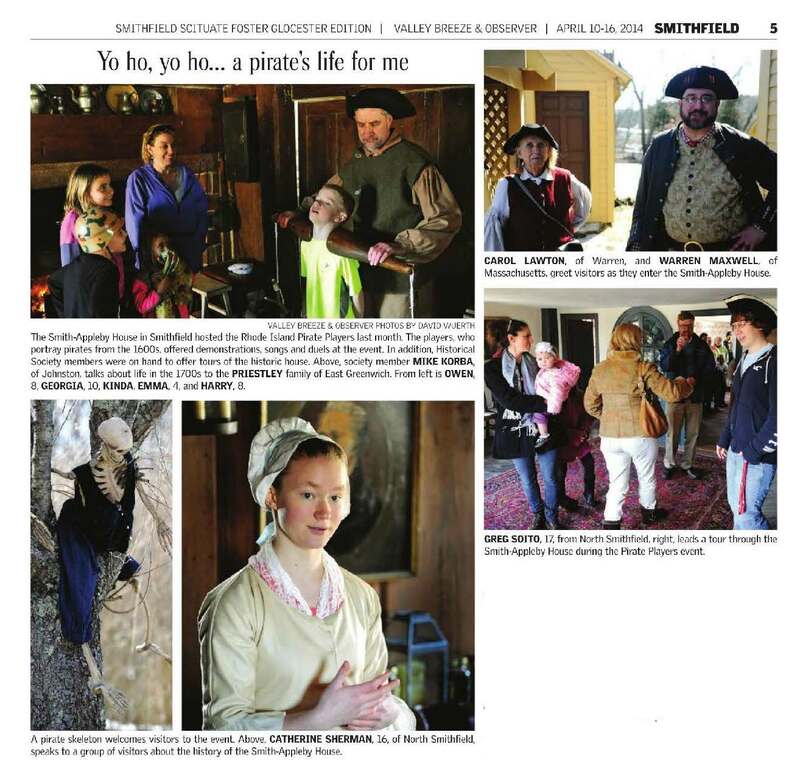 Pirates Invade Smithfield: The Smith-Appleby House & Rhode Island Pirate Players are featured in the April 10, 2014 issue of the Valley Breeze/Observer. The photos and news items appeared on page 1 and 5. Yo ho, yo ho… a pirate’s life for me! 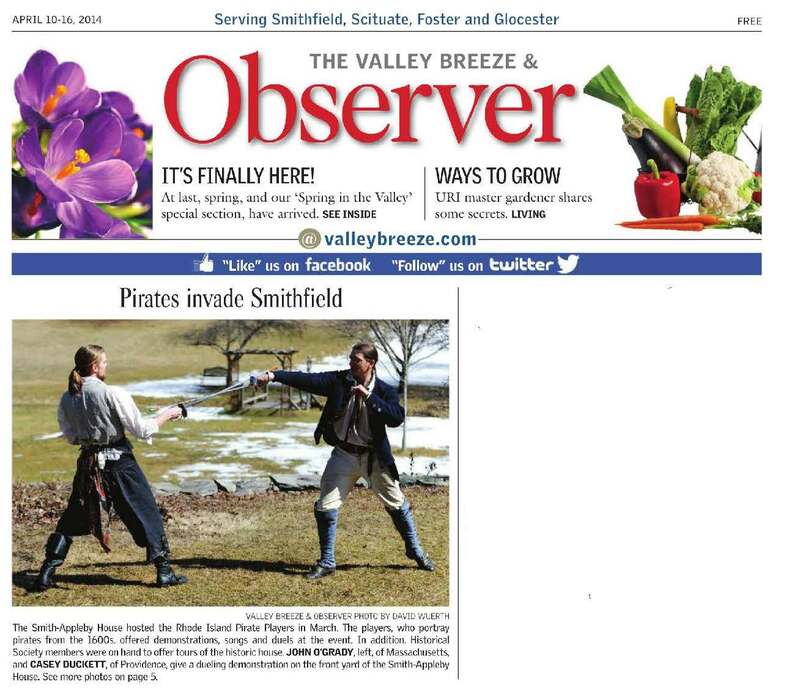 The Smith-Appleby House was front page news in the Valley Breeze & Observer (Smithfield/Scituate/Foster/Glocester) Feb. 6-12, 2014. There’s a great color photo on the front page and four black & white photos inside. They are all from the “All About Apples” event on Saturday, Feb. 1, 2014. 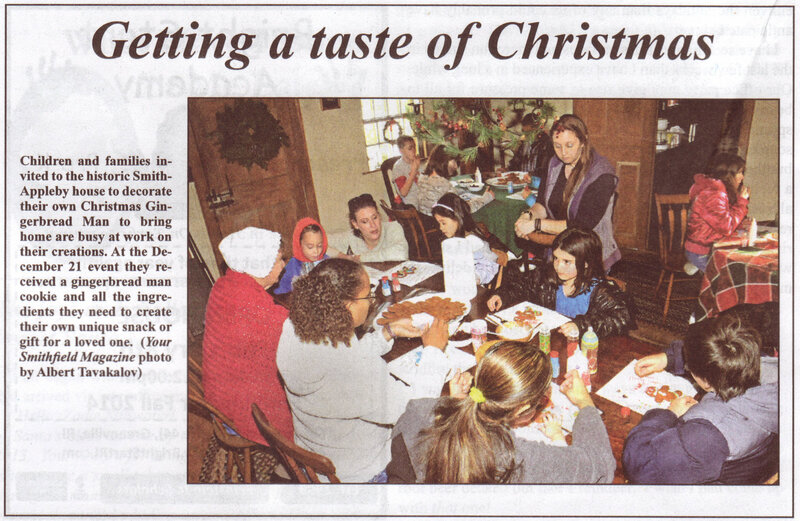 Children and families invited to the historic Smith-Appleby house to decorate their own Christmas Gingerbread Man are busy at work on their creations. At the December 21 event they received a gingerbread man cookie and all the ingredients they need to create their own unique snack or a gift for a loved one. 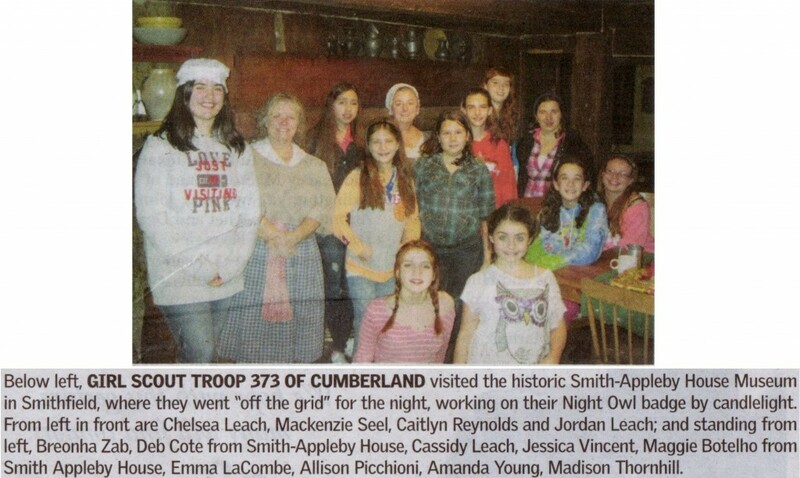 Girl Scout Troop 373 of Cumberland visited the historic Smith-Appleby House Museum in Smithfield, where they went “off the grid” for the night, working on their Night Owl badge by candlelight. Just in time to give you Halloween goose bumps and raise the hair on the back of your neck, a Rhode Island vampire tale that deeply influenced the man responsible for conjuring literature’s most famous bloodsucker is coming to Newport. … “The Tillinghast Nightmare” was shot at the Smith- Appleby House in Smithfield, R.I. The scene above from “The Tillinghast Nightmare” was shot at the Smith- Appleby House in Smithfield, R.I. In the film, Tiffany Lively portrays the mother and her daughter, Sadie, plays theTillinghast girl. 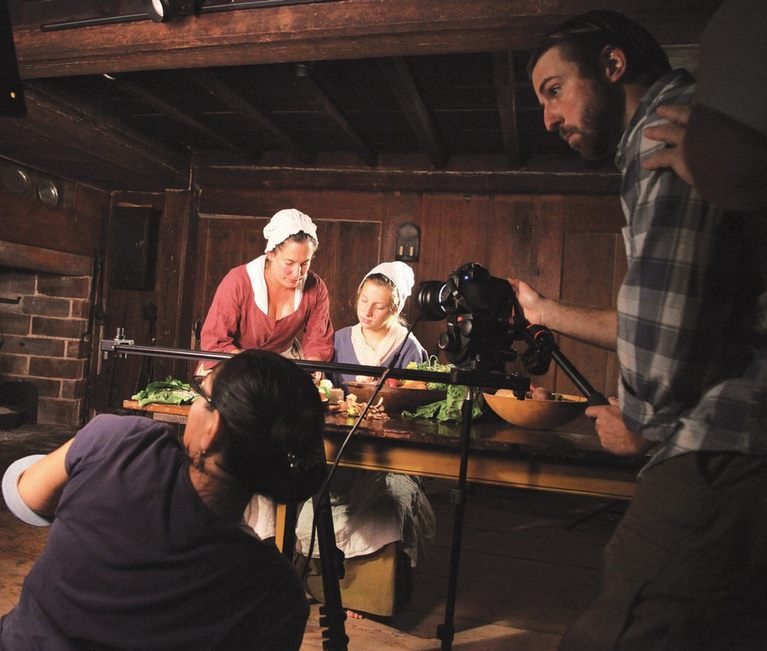 Film crew in the foreground is Magda Grover and Tim Bonavita, standing. The film will be shown on Tuesday, Oct. 29 at the Jane Pickens Theater. (Photo courtesy of Historical Haunts).